It’s much easier to import advertisements instead of inserting them one by one. Import tool for ads is a new feature included in our 2.4.0 release as well as many other features. We allow to upload as many images as you configured, so if you allow 4 images in the CSV you need to have 4 columns, even if they are empty add them. Images allow remote images like http://lorempixel.com/1200/800/technics/ or local, using as base your site root, for example /images/import/ad1_pic3.png. The images will be downloaded, resized, thumbed, and deleted on completion. 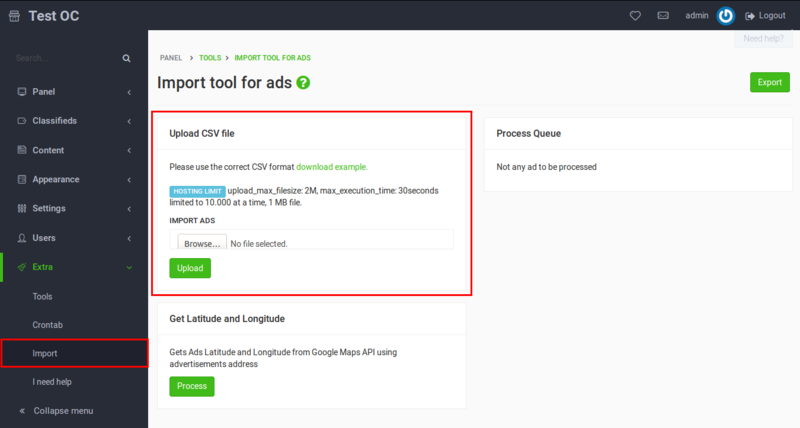 Now it’s possible to import ads with custom fields. All you need to do is to add the fields in the CSV file as headers, with the prefix cf_. For example, if you have a custom field called “currency” in your site, you need to include it in the CSV file headers as “cf_currency”. Download Sample CSV file working for 4 images without locale or stock. Click Process on the right box. Now, you can see the imported ads on Classifieds -> Advertisements. How to use import tool for categories and locations?